In the Night Garden Live 2017 is on sale now! The world’s only live productions of the Cbeebies top-rated show will visit London, Birmingham and Manchester this summer, on tour from 25 May to 28 August. We went last year and cannot wait for this years show. 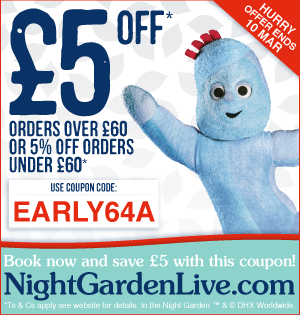 Visit Night Garden Live to book your tickets, and enter EARLY64A at the checkout to save up to £5* off your order. Ticket prices are between £12.50 – £35. The code can be used between 10th February and 10th March 2017. Don’t forget, all tickets are covered by the Flexible Exchange Policy, so if you need to you can swap your tickets for another time and date for a small fee. *Coupon will take £5 off orders over £60, or 5% off orders under £60. Ts & Cs apply, please visit terms and conditions for more info. Loved this when the kids were small – a live show sounds like great fun! My son loved In the Night Garden when he was younger and they always put on a good show.